Kids' Interactive Learning Pad Just $9.95! Down From $40! Ships FREE! You are here: Home / Great Deals / Kids’ Interactive Learning Pad Just $9.95! Down From $40! Ships FREE! Kids’ Interactive Learning Pad Just $9.95! Down From $40! Ships FREE! Tanga has this Kids’ Interactive Learning Pad for just $9.95 (Reg. $30) today only! 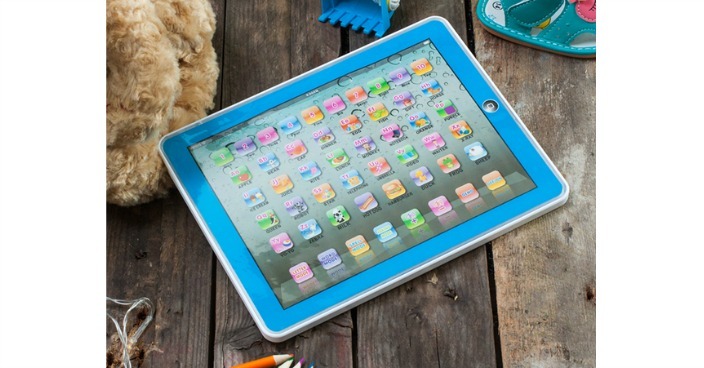 Is your child constantly playing with your expensive iPad or Tablet? They can now have one of their own! The Interactive Learning Pad is a fun, early development toy to help infant children learn the alphabet and numbers. Designed to help improve knowledge of numbers and letters and assist with tactile and dexterity learning for young children. Boasts 4 quiz modes, songs and plenty of sound effects. Designed with functionality and child safety in mind, it allows your child to learn at their own pace and in their own way.